One of the main questions Matchless Coffee Soda™ fans ask us is how we brew our coffee base. The answer: flash-chilling. WHAT IS FLASH-CHILLED ICED COFFEE? Flash-chilling, also known as Japanese style or ice-brew, involves extracting the coffee with hot water and then bringing that batch down to a colder temperature very quickly. This is unlike cold brewing where the coffee is extracted with cold water over a long period of time. When you brew coffee with hot water, you're able to extract more of the volatile compounds and flavors of the roast that you can't achieve with cold water brewing. 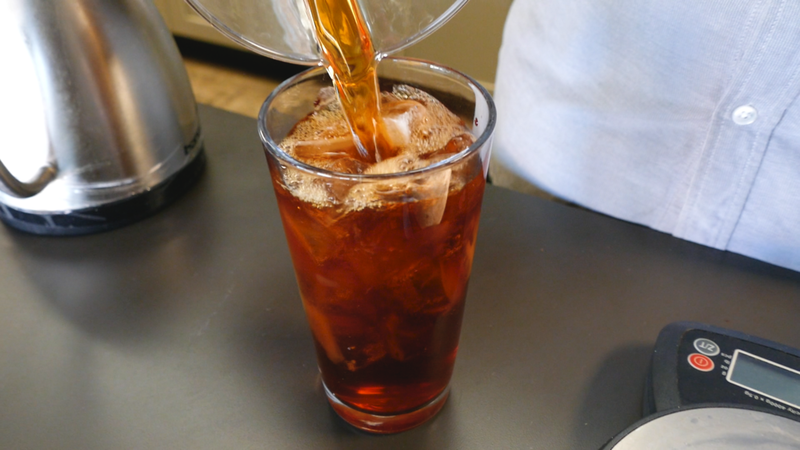 While we like cold brew, it typically has one note, or flavor, which is chocolaty and rich. For Matchless, we wanted to express coffee's naturaly refreshing nature, including it's fruitiness, and that can only be accomplished with a piping hot brew. HOW DO YOU FLASH-CHILL COFFEE ON A LARGE SCALE? Nathanael Mehrens of Matchless Coffee Soda™ takes you step-by-step through the flash-chilling process. Also known as flash-brewing or Japanese style iced coffee. Step 1: Rinse your filter. Place your filter on your Chemex, or another brewing device, and do a quick rinse using hot water. Once the paper is fully saturated, remove the wetted filter and pour out the water. 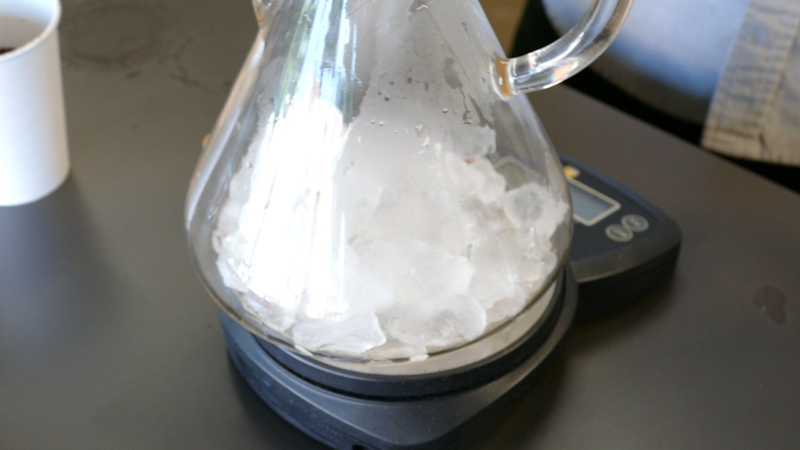 If you're using a Chemex, pour your ice into the bottom of the glass and replace the filter on top with the three folds facing the pour spout. If not, simply add ice to a receptacle that will catch the flow of coffee as you brew it. Remember to zero out your scale! Your ratio is 50g of coffee to 800g of water. We suggest a coarse grind similar to a sea salt consistency. Remember to zero your scale again to accurately measure your water levels in the next steps! Make your grounds level and add a divot with your finger to ensure all of the grounds get saturated evenly. Add 100g of 208° water to release the gas trapped in your coffee grounds. (You'll notice it balloon and release air bubbles.) Using a spoon, gently stir your grounds to ensure everything is wet and evenly saturated. Using a spoon, gently stir your grounds to ensure everything is wet and evenly saturated. Add your remaining hot water in stages ensuring that the level of saturated grounds stays at a consistent inch to two inches below the rim of the Chemex. Swirl the hot coffee and the ice in the bottom of the Chemex to dissolve any remaining cubes and bring the mixture to its proper dilution. Then pour over ice and serve! The ratio Nathanael likes to use at home is 1 part coffee to 16 parts water, or in this case, 50 grams of coffee to 800 grams of water. It will serve about 2-3 glasses. Add 300g of ice and replace your rinsed filter. Add 50 grams of coarsely ground coffee. Bloom the coffee with 100g of 208° water. Add the remaining 400g of 208° water in stages. Agitate to dissolve remaining ice then pour over ice and serve!